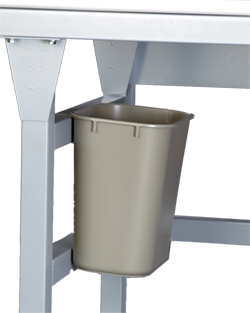 Add finishing touches such as a lamp bracket, waste basket, and protective leg boots and corner protectors. Click tabs to view individual Specialty options. 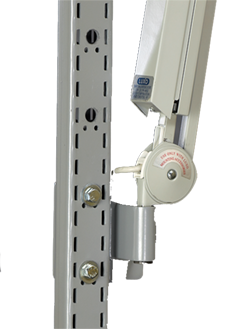 Leveling casters offer an advanced solution to making a bench or workstation stationary and mobile at the same time. 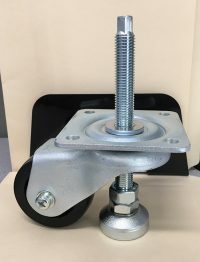 Low-clearance Leveling Caster has 1100 pound capacity per caster with thumbwheel adjustment. 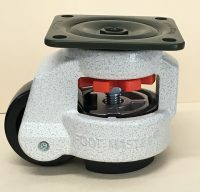 High-clearance Leveling Caster has 750 pound capacity per caster. 3″ diameter wheel requires tool adjustment. Boots are sold individually per leg. Highly recommended for use on mobile units to protect corners, walls, and other objects during travel. 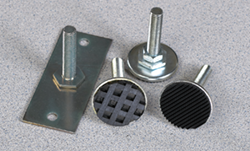 Corner Protectors are sold individually, and require drilling into worksurface. 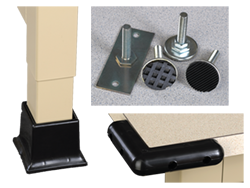 Corner Protectors will not fit at rear corners if Solid Uprights are installed, front corners of Post-Formed tops, or on Epoxy Resin Tops. Mini Corner Guard 4-Pack (2 1/4″ x 2 1/4″). Mini Corner Guard 12-Pack (2 1/4″ x 2 1/4″). The smaller Mini CornerGuards are suitable for use on metal worksurface corners, and will fit many accessories such as undertable shelves, worksurfaces, drawer cases, etc. Adhesive materials are NOT included.